Usualy I wouldn't show you something like this but... I stayed at a Comfort Inn in Portland - Mohammed Atta stayed here the night before 9/11. A number of major cruises dock in Portland. Portland's dock area is a clearing house for lobster and other sea faring animals. Portland is one rocking city if I say so myself. It feels like one big version of Boston's North End. A lot of classic charm, at an approachable size. Lobster is synonymous with the state and Portland's dock area has a number of locations to buy and ship them home, or for consumption on the spot. The Portland Lobster Company is a decent place for seafood, but a little too slick and touristy. I ventured into the city's "suburbs" - The Eastern Promenade and The Portland Observatory are definite things to check out on a journey there. Heading to the south a little to Portland Head, is one of New England's more picturesque light houses. I can't say I'm an avid light house seeker, but having seen nearly ten or so this summer - I'd put Portland Head on the top of my list. By default it seems, lighthouses tend to be in scenic areas. 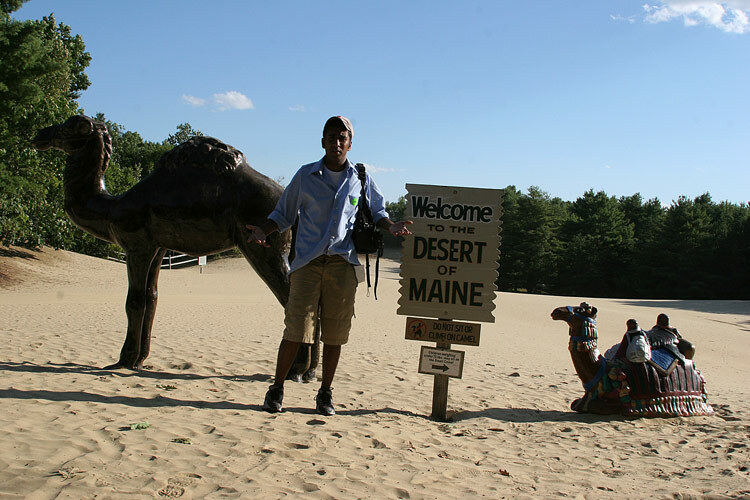 Driving northwards, to Freeport, a oddity in terrain, the Desert of Maine is a swath of glacial silt miles away from the ocean, that was uncovered earlier this century by a farmer who failed to rotate his crops. Now the sand stretches for a couple hundred acres and can be as deep as 90 feet. Almost at the level of roadside oddity - it is an interesting sight to behold and the tour is amusing. Freeport is the home to L.L. Bean. Leon Leonwood Bean built an industry out of supplying Mainers waterproof boots - now it's a fashionable outdoor wear apparel line. The factory store is open 24 hours a day. I would be tempted to see who is around at like 3 a.m. buying some random piece of outdoor gear. From there it was one mad, four hour long dash up to Bar Harbor in "Down-East" Maine. I think I pulled into some random motel around 12:30 for the last room in Ellsworth.